For the next installment in the VT DKE tailgate season, the Dekes are coming down to Blacksburg for the UNC game on Saturday, October 5th. Our tailgate will be open before and after the 12:30 game. In the late afternoon, the actives will host an open house at the 102 year old DKE house. As always, all are welcome. The tailgate will take place in our usual lot 4 location, crawling distance away from the stadium. We will have plenty of food and booze provided by the Tailgate club for all to enjoy. Due to the early start, we will keep the tent up after the game for those who want to keep the party alive. 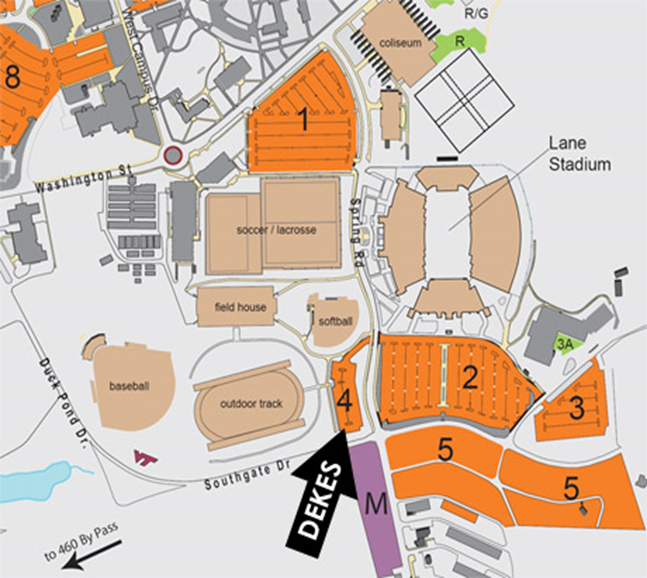 Below is a map of our tailgate spot. After the tailgate, come meet the active chapter and view the historic house at 302 East Roanoke St. The actives can't wait to show off the house and the new pledge class of 14 strong. If you plan on attending, we ask for a $25 suggested donation to the tailgate club and rsvp to Charlie Webb (cwebb@benefitsgroup.net). The donations cover the food, drink, and tent rental. I have set up a Paypal link below for donations. We will also be accepting donations at the tailgate and the house.